If Brian Wilson had stayed healthy for the 2012 season he might have been at the top of this list. With relief pitchers it was harder to set guidelines to rank them. So I went with the "Screw it, these are my favorites" this time. Wilson was the closer when the Giants finally won a championship in San Francisco in 2010. The role on the Giants as closer seems to have 3 guys, and that's this list. I know we all love the beard, but Wilson's act would have worn thin if he hadn't been performing. He was. In 2008 Brian had 41 saves on a club that went 72-90. In 2009 he was in the top 3 with 38 saves. Then in 2010, the year of torture filled ballgames, Wilson was at his best. He had a Major League leading 48 saves for the champs. He was great in the playoffs as well allowing no earned runs in his 10 appearances. 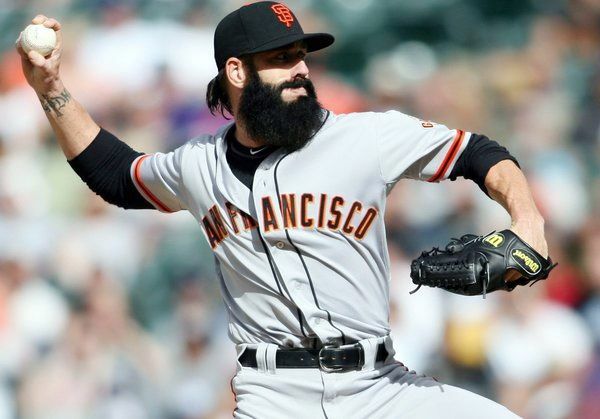 Brian Wilson never has to buy another drink in San Francisco. 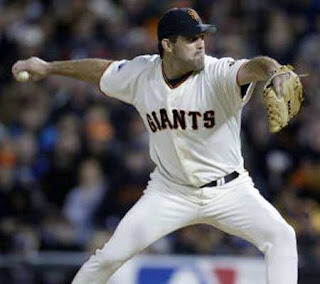 The right arm of Robb Nen was all but sacrificed for the Giants during their playoff run of 2002. The man that would tap the ground with his lead foot before delivering the pitch, never stepped on a Major League mound again. He gave everything he had for that trophy, it's a shame they fell short. But Nen helped put the Giants in that position. During the playoffs in 2002 he saved 7 of the 10 Giants victories. 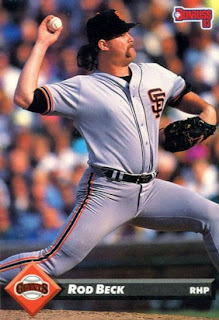 Robb Nen was a 3 time All Star with the Giants. He is the franchise leaders in saves with 206. Consider he only pitched 5 seasons with the club. His save totals for the 5 years were, 40,37,41,45,and 43. In 2001 he led the NL in saves, and every year with the Giants he was in the top 5. With a fierce determination and a slider to match Robb Nen was one of the best there was. This is a good time to remind you that this is a subjective list. I'm sure there are a lot of great relievers in the history of the Giants, but I wanted to pay my respect to these three. Rod Beck is the top of my list. "Shooter" was always something to watch on the mound. The way he would look in for the sign, right arm dangling and swaying, was almost beautiful. It didn't matter that Beck looked like the local trailer park drunk that rolled out of bed to pitch in the game. He got the job done and was loved. Beck came up with the Giants and was the closer for a while. He is 2nd in franchise history with 199 saves. But he didn't just come in for the save, he had a total of 416 appearances in the orange and black. Rod was a 3 time All Star and the 1994 Rolaids Relief Man winner. His high save total was 48 in 1993 for a team that just missed the playoffs. In 4 of his last 5 years with the Giants Beck was in the top 3 in saves in the NL. He finally made it to the playoffs in 1997 but only appeared in one game. Tragically Rod Beck died at the age of 38. He may be gone, but "Shooter" is never forgotten.